My 2011 domaining is off to a good start. I have one negotiation which is close to ending soon. A high traffic company replied back to express interest in a cover letter domain specific to their services. These two cover letter domains are going to produce sales in the next week. Furthermore, CollegeDegreeDiploma.com scored 6 ad clicks in the past few days. The clicks produced $25. Education and resume domains are performing well. Because of the anticipated cover letter domains sales, I will be able to cover the cost of registration for all my resume and cover letter domains. I consider the cover letter purchases to be a positive decision. I still have dozens of resume and cover letter domains available for sale. The two cover letter domains are quality domains that I’m sure the end-users will use to improve their performance. I’m not worried about selling the domains because I own many more. CollegeDegreeDiploma.com is the biggest surprise of 2011. According to Estibot and Valuate, the keywords are only searched 170 times per month. When I first purchased the domain, the averaged 400,000 keyword results. Since then, the average keyword results are now at 1,690,000. The CPC is at $7.12, which is highly competitive in its category. I always knew this domain would perform the best. You don’t need to find domains with more than 1,000 local monthly searches. Frank Schilling own DegreeDiploma.com, which I’m sure he scores some nice parking revenue. The difference between the two parking platforms is that Why Park has content, whereas DegreeDiploma.com operates on the parking account. Those who claim domain parking is dead are not trying hard enough to find the right domains. You have to assess the market to determine what is popular. My most popular domains are resume, cover letter, education, and jobs. I stocked up all product and service domains, as well. Find highly competitive CPC domains in the fields I mentioned above, and put up quality content to generate traffic to your domain. Why Park is an excellent platform that gives you many options to make revenue. You can build a web directory, use shopping apps, music apps, and generate ad clicks based on the domain’s keywords. I’m amazed that my cover letter domains are generating attention. Many resume domains are performing good, but are not as successful as the education domains. Education domains are competitive because there is high demand for online education. Why Park provides you with the tools to find traffic. All you need to do is keep visitors on your website. Don’t share too many links that will reroute them to another location, unless you’re using an affiliate program, or another website that can make you revenue. The goal is to keep your visitors coming back. It is well worth your time to write education articles. Share your personal experiences, or conduct research on various degrees and programs. Resume and cover letter domains are going to be very popular this year. I sense I will make a dozen more sales. I plan to prepare additional content and build more web directories to make revenue. Domaining is essentially buying and flipping domains in the shortest time possible with incurring registration fees. 200 of my domains are expiring in two weeks. However, I don’t mind if they do, but I will continue to look for buyers. If I have to sell the domains cheap, I will to at least make back the cost of registration. The domains that are going to expire are mostly NYC-related. I sold 11 taxi domains back in the Summer, which targeted New York City. I made enough to offset the cost of these domains. I have the NYC domains and a few others that I don’t plan to renew, but then I have others that I will need to assess to determine their performance. I know that I will probably renew DeliciousThaiFood.com, BelieveInEnergy.com, CakeGalore.com, RingsDb.com, NYCSinglesClubs.com, DripPainting.com, DripPaintings.com, EnglandNew.com, PursesCoach.com, ScriptReader.net, and a few others. These domains have performed well enough to keep. I will tough time trying to determine which domains to keep or let drop. It all comes down to performance. I won’t have any problems with my job, hotel, Suisun City, education, and resume/cv/cover letter domains. This is the first time I faced a decision with renewals. I recently renewed Venezia-ABC.com, which is a domain I won on a Go Daddy auction. I couldn’t let the domain drop because it is the only one I won in an auction. I paid $175 for Venezia-ABC.com. The domain once produced nearly 2,000 unique visitors per month, had a Google Page Rank #2, 2,000 backlinks, and 17 sites that link in. Sedo’s price suggestion recommended the price to be set at $2200. I have no idea what type of website it once was. I had little experience with domains at the time. However, I did purchase various domains that enabled me to make future sales. I thought WebsiteOutlook.com provided me enough information to make a good investment. I assumed I could make $3.50 per day on ad revenue. As I learned more, I knew that maybe I should have let others beat me in the auction. In my opinion, Website Outlook is a quality tool for an established websites, but the appraisal platform has some difficulty with appraising keyword domains, as well as newly registered domains. The appraisal platform is only a tool, and not a means to determine a domain’s worth. I don’t regret purchasing the domain, especially when it’s the only one that cost me above registration prices. 7Zoom is a similar domain valuation tool that provides quality performance stats, including unique visitors which is retrieved from Compete.com. Estibot has helped and has impaired my judgment when searching for domains. If I never used Estibot, I would not be in the domain industry today. I found so many good domains on the drop. I located domains that I assumed would never be available. Name Boy tricked me into believing that hyphenated NYC domains were worth thousands. I registered a hundred NYC and Hollywood names because of that appraisal system. I don’t regret my mistake. I managed to register a few domains in the bunch that produced good sales later on. Because I valued jobs, movies, NYC, travel destinations, and taxis, I made a few good sales that kept me in the domain industry. ResumeServices.co inspired me to register many resume, cover letter, and cv domain names. I found many that are searched more than 1,000+ times a month. Don’t avoid the domains that have less than 1,000 month searches. CollegeDegreeDiploma.com is now making good parking revenue. EmpireStateHotel.com, TicketNUB.com, LeatherManBags,com, and many others have made back the cost of registration. I feel that 1932Quarter.com was a great find. I value ResumeCampus.com, CoverLetterServices.com, ResumeCompanies.com, NursingCoverLetters.com, PhotographerResume.com, TherapistResume.com, VideoGameWriting.com, ScriptWritingJobs.com, and dozens of other domains. I really don’t have a favorite domain yet. I wouldn’t sell CoverLetterServices.com and ResumeCampus.com due to my plans to develop them. The moment I land a one word generic domain, I will definitely put work into building the domain. I really believe Maniki.net and DeAnza.net will produce good sales. DesignerGloves.net, OrganicCandles.net, DesignerBras.net, and MagnifyGlass.net are good domains to score a decent sale. My hotel domains and job domains are going to do good, as well as all my Suisun City domains. Parking is not dead. CollegeDegreeDiploma.com shows that a good education domains can score quality clicks. Why Park has a awesome platform to build domains into functional websites. If you haven’t used Why Park yet, you should give it a try. I’m definitely satisfied with the results. My domains will continue to produce traffic and revenue as long as I put work into uploading quality content. Even domains I put little work into are making revenue. You never know when you will find a good domain. It’s hard to make a decision to renew or drop a domain. I’m confident that I know what to do when the time comes in two weeks. In retrospect, 2011 is going in the right direction. It’s only a matter of time before I find a good generic domain to build into a brandable website. Until that time, I will work with the hand I already have. I plan to bluff my way into winning a future domain jackpot. Education, resume, and job domains are good verticals to operate within. Focus on those areas, and also look for some .net product domains at the cost of registration to flip for a small profit. Never assume the good domains are gone. I find many that are unregistered. I don’t use drop tools or sites. I put in the work to type-in all the names I think will be popular. Good luck on domaining. Thanks for reading. Why Park helped me to revise CoverLetterServices.com. I’m going to invest time and money to build the website into a popular destination for resume and cover letter seekers. I have dozens of pages of resume and cover letter search data. I will write articles to capture traffic in those areas. I own exact job resume domains such as TherapistResume.com, PhotographerResume.com and PrResumes.com. 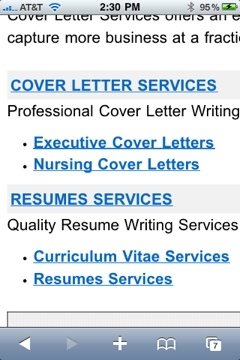 NursingCoverLetters.com, ExecutiveCoverLetters.com, and EducationCoverLetter.com are quality sites. I plan to develop ResumeCampus.com and ResumeNewsletter.com. There are still many quality domains available. ResumeSupply.com is up for sale at BuyDomains.com. I think the domain is a good investment. The last time I checked the price, the domain cost $195. It went up to $250. I own ResumeSupplies.com. I would really like to know how end-users are tricked into spending 50 times the value of a domain. There’s no accurate appraisal system, but that doesn’t mean a domain is worth what a buyer pays for it. I plan to write more articles on recent sales. I prepared a handful of articles in the past challenging prices paid and rejected offers. Maybe I’ll schedule an interview to question an end-user on their purchase. CoverLetterServices.com is going to earn good revenue as a web directory. CoverLetterService.com is up for sale on Go Daddy for $2,000. A past cover letter company once provided cover letter service, but closed down the site. The website is still present, though I can’t use any links on the page. On the opposing side, web directories have potential to make you good money. You can set the listing price at any amount you deem as fair. ResumeCoverLetterTemplates.com produced another 6 clicks on Sunday. The domain manged to score 10 clicks in the past two days. “Resume Cover Letter Templates” are commonly searched keywords. The average keyword results are 271,000, the monthly popular global searches are 1,958, and there are 725 local monthly searches. I have only owned the domain for 30 days. I put up shopping apps, resume services listings, new movie releases, and video apps relevant to the domain name. On the shopping apps, I promote resume papers, tablets, MAC laptops, and resume writing software. Why Park rotates articles on my sites. On the contrary, I do write articles on content that is more within my field of expertise such as college, sports, tickets, writing, and etc… One movie .info website generates consistent traffic from all over the world. I add links from that site to my other popular websites. I’m confident that resume and cover letter domains will make a ROI. The main reason these sites are producing clicks is because I build them right away. My least popular sites are not fully constructed. This is in results of migrating my entire portfolio from Go Daddy to Why Park. I originally had 50-100 domains on Why Park, but then expanded my collection to 790 domains. The NYC sites and many other sites are not targeting the keywords. I have to visit every site to choose the right keywords, add apps, and to build them out. I’m sure I lost revenue in the process. I made it a point to build every new site right away. I noticed that Why Park’s new apps increased my traffic and click rate. There is more diversity with the compare shopping apps, business listings, videos, weather, and movie apps. The video titles I choose are what brings the traffic over to the website. In addition, choosing shopping titles such as “Compare and Save on ____” entice visitors. I’m experimenting with different strategies to see what works best. I will likely take a website developing and SEO course this upcoming year. There is a lot of money to be made. I’m missing out on quality traffic. 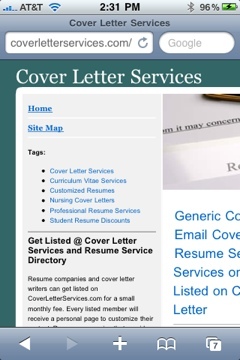 ResumeCoverLetterTemplates.com is becoming a more popular site. ResumeSupplies.com, Resum.net, CustomResumeService.com, freecoverletter.net and a few others are producing consistent clicks. My oldest resume domain, which is my first, is ResumeServices.co. It has produced 3 clicks since September. It takes time for new domains to grow. Resume companies that are lacking various keywords will come knocking soon. I’m also proactive in contacting companies. We’ll see. Check out Why Park to experiment with their domain development platform. If you own hundreds or even thousands of domain names, you probably lack the time to develop every site. Traditional parking have restrictions is how you can promote your domains. Why Park is a good compliment to building quality sites with ease. On Friday, ResumeCoverLetterTemplates.com scored 2 searches and 4 clicks. Resume and Cover Letter domains are beginning to generate traffic and clicks. I expect the other resume, cover letter and cv keywords to generate clicks in the next few months. My portfolio will shrink to below 500 in the second week of February. I’m planning to go after more expensive domains once I move a few domains. If I fail to sell the 250 expiring domains, it will not affect my investment. These domains are ones that don’t define my monthly revenue. I don’t have the time to write content on the sites, so selling them cheap or letting them drop may give another an advantage to generate revenue. There are many domain investors purchasing resume and cover letter domains. On the opposing side, there are others that consider them to be worthless. There are thousands of resume companies in the United States. The UK alone, has many cv and resume services. If you own any resume and cover letter domains, and plan to sell them, I don’t recommend you cold calling companies. The main reason I have luck with selling domains is because I establish a rapport with companies and buyers. I believe that when the time is right, I will probably make a nice profit with the resume and cover letter domains, as well as with the education domains. DegreeFields.com produced 1 click at $3.77. Imagine if I put actual information on the hundreds of degree fields. I can share my education experience, such as providing information on how to choose the right degree fields, what to expect, how to write papers, ways to find financial assistance, and other education information. Education domains produce high clicks because there is more competition to bid on keywords. Any education keyword domain paired with “online” tend to have extremely high cost per click. While I may not earn the full amount on the clicks, I still enjoy the Why Park format. Why Park rotates articles on sites to ensure there is up-to-date content. The new domain apps defintely increased my revenue. The top domain earners are 1932quarter.com, TicketNUB.com, EmpireStateHotel.com, LeatherManBags.com, ScriptWritingJobs.com, MobileMovies.info, CakeGalore.com, DegreeFields.com, ArtistGrants.net, DonatetoStudents.com, and InfluenzaVaccine.us, which have generated the majority of my parking revenue. The domains above have high searches. Many assume that domainers buy keyword domains for their type-in value and organic value. However, I find that owning quality keyword domains are good for SEO purposes. I know that many will not type certain domain names in their search engine. Back in the 90’s, most people would not type in a various domain name until the public caught on to the website’s value. Many people that need resume services will not type resumeservice.com and resumewriting.com. These two domains sold for $28,000 and $66,000 in the past month. Neither domain had any backinks, was ranked on Alexa, and didn’t have a Google Page Rank. DegreePrograms.com sold for $33,000. I spoke with the owner of that domain on the phone and through e-mail. She uses that domain to forward traffic to her education website, along with a few hundred other keyword education names. DegreePrograms.com doesn’t have good performance stats past the keyword value. When I mean performance, I’m suggesting Google Page Rank, backlinks, sites that link in, and monthly unique visitors. On Compete.com, the domain fails to produce any traffic. I noticed that Go Daddy’s auction produces many sales based on performance stats. I don’t see the value in owning a domain such as degreeprograms.com for type-in use, especially when you have to pay $33,000. Only a few people will type-in degreeprograms.com in their search window, but not enough to make it worthwhile. I could spend $200, and buy 25 .com domains to push traffic to the website. I would probably get better results with the $200 than on spending a fortune to get meager results. Businesses will never listen to people when they have good advice. My success hinges on hand registering domain names. I only paid above the cost of registration on one occasion. After that purchase, I never again paid more than the cost of registration for any domain name. The domain once produced nearly 2,000 monthly unique visitors, was a Google Page Rank #2, had 2,000 backlinks, and 17 sites that link in. Sedo recommended the price to be set at $2200. I never attracted any interest to the domain. Since winning the domain back in Jan, the backlinks have dwindled down to 1,500, and the unique visitors went from 800 to less than 100 a month. If I could, I would sell the domain for the same price as I paid for it. I have no clue what the past owner featured on the website. I e-mailed a few people that mentioned the website as being their favorite, but they never replied back. I don’t understand how two dozen bidders battled me to win the domain. Now when I put that particular domain on Go Daddy, I can’t get even 1 view. Domaining can be an exciting game when you find good names. I believe I found good names because I sold them to make an average of 70-100 times the cost of registration. I don’t consider myself a failure with purchasing new domain names that have good appraisal value. Such keyword and price value enabled me to sell them to an end-user. On Why Park, I make enough to renew 5 .com domains per month. Because of hosting the domains at Why Park, I can promote my eHow articles. The monthly revenue is nothing to brag about, but it is enough to renew 2 domains per month. As time permits, I can probably increase exposure to the articles due to their commercial value. I purchased 810 domains since January. I don’t plan to renew the domains come next year. Domaining is about finding the right domains to make money through parking them while also searching for buyers. I operate at the least amount of overhead cost. I paid very little for .info domains, which have generated a good return on investment. I sold 5 .us domains, 1 .info, and 19 .com domains. Resume and cover letter domains are producing clicks. In evaluating monthly performance, I don’t renew domains that have little performance. The time hasn’t come around yet to renew any domains. Beside the 20 domains I purchased in Jan 2009, I only acquire 810 domains this year. I invested in all extensions and niches. I don’t plan to renew 785 domain next year. I have a list of 100 domains I plan to keep for future value. I will shop around the remaining 685 domains. The domains listed above generate the majority of the parking revenue. At any given moment, another domain will generate a nice click. That will change my mind on letting the domain drop. There is always a new domain that produces a click. Some produce a few clicks, and then never generate another for months. I pay attention to the domains that produce consistent clicks. I upload new content on good performing domains to keep the traffic coming. The resume and cover letter domains are slowly picking up steam. I researched many of the good keywords, so I’m confident there are plenty of future clicks and sales in that field. I don’t renew my domain portfolio every year because I only started to get serious about domaining this past January. It wouldn’t make sense for me to keep registering the same domains every year when they don’t make me any money. I register domains that I think will generate attention through parking them and finding a potential buyer in the aftermarket. When such domains don’t make me money, I will let them drop. In the meantime, I will look for buyers, reducing the price as each month draws closer to the renewal period. A store that doesn’t sell a particular item is not going to invest more money into bringing it back the next year. It’s the way business works. Demand is the key to making money. Currently on the Internet, demand is in education, resume, jobs, shopping, news, and social networking. I know a past buyer that will buy all my job domains. I’m not worried about selling any job domains. I buy many new domains because I can’t afford to bid against other domainers with deeper pockets. I invest time into searching for the best keyword domains that I can hand register at minimal cost. MobileMovies.info and Pier39.info prove that a small $1 investment can make a nice profit. Many of my .info domains can sell at an average of $25-50 per domain. As I work on different selling strategies, I will write articles on the steps. I’m working on a resume company to purchase 4 resume and cover letter domains. If that sale is successful, I will definitely reveal my selling technique. I can tell you that I have to be persistent throughout every sale. It is never easy to make a sale unless a random buyer clicks on one of my advertisements that links to my domains at Sedo. That only happened on two occasions. Another time I received an offer on a job domain at Sedo. The negotiation process lasted 3 days until the buyer and I came to an agreement. Through communicating with the buyer, I managed to sell 6 more job domains. For the most part, his primary interest is in developing job domains. I had to put in some extra work to sell 4 movie domains to an online movie company. I researched their website, as well as their competitors to determine the difference in their target audience. I spoke to the company’s marketing/webmaster regarding how to improve their website’s performance. In result of my time and advice, the owner purchased 3 domains to implement into their marketing plan. The first sale occurred because I contacted the movie company through the Whois Lookup on Estibot.com. If you own an I-Phone, the e-mail feature is easy to use. The owner initially replied back that he didn’t need the domain due to its low traffic. In the reply, I explained to him that it takes time to generate traffic, and I never put in the work to increase the domain’s traffic. I focused on the keyword stats to build interest in the domain. I knew how to price the domain, so that helped me to produce a sale. The owner asked what I thought the domain was worth, and what price I was asking for it. I supplied the appraisal value, and offered the domain for 50% of the worth. The domain is specific to the movie business. It produces nearly 1 million average keyword results, and is searched for 3,000 times a month. Due to that sale and investing time into researching the website, I sold 4 domains to the company. In the near future, I will share more about how I sold various domains. ResumeCoverLetterTemplates.com performed well with 4 clicks. The revenue was very little, but it demonstrates that people are searching for the keywords. My most profitable resume domains are Resum.net and ResumeSupplies.com – they earned a few dollars in the past month. Thanks for reading. Domaining Mojo syndicates its weblog posts and Comments using a technology called RSS (Real Simple Syndication). You can use a service like Bloglines to get notified when there are new posts to this weblog.